Entrance to Angkor Thom in Siem Reap, Cambodia. Our arrival in Bangkok, Thailand marked the start of our whirlwind tour across Thailand, Cambodia, and Malaysia. In Thailand you are never more than a “tuk-tuk” ride (see below photo) away from anywhere you want to be and it was fun exploring the cities in this fashion throughout our trip. Thailand boasted some of the tastiest food we have experienced yet – green papaya salad (spicy salad made from shredded unripe papaya), green curry, Tom Kah Gai (coconut chicken soup), Pad Thai (stir-fried rice noodles), and even the classic “fried rice” is served in unique ways. Siem Reap, Cambodia is a short one-hour flight from Thailand and the city is visited almost exclusively for its access to the Temples of Angkor, which was recently voted by Lonely Planet as the world’s #1 site. Although our time in Siem Reap was brief we met some of the nicest people on flights, at the hotel (hi Sania! ), and on tours. Kuala Lumpur (KL) was an unplanned stopover, but since all of our options for getting to Bali connected through KL we decided to spend a few days exploring the capital city of Malaysia. Our stay was enhanced through the use of Starwood rewards points as we were upgraded to a deluxe suite at the Royal Orchid Sheraton Hotel along the riverfront. Bangkok is a massive city and the Chao Phraya River cuts directly through the center which is a means of transit for many people. Staying along the riverfront made it easy to hop on and off riverboats to get from place to place in Bangkok. Our favorite temples were The Grand Palace and Wat Pho which were easily accessed via the riverway. 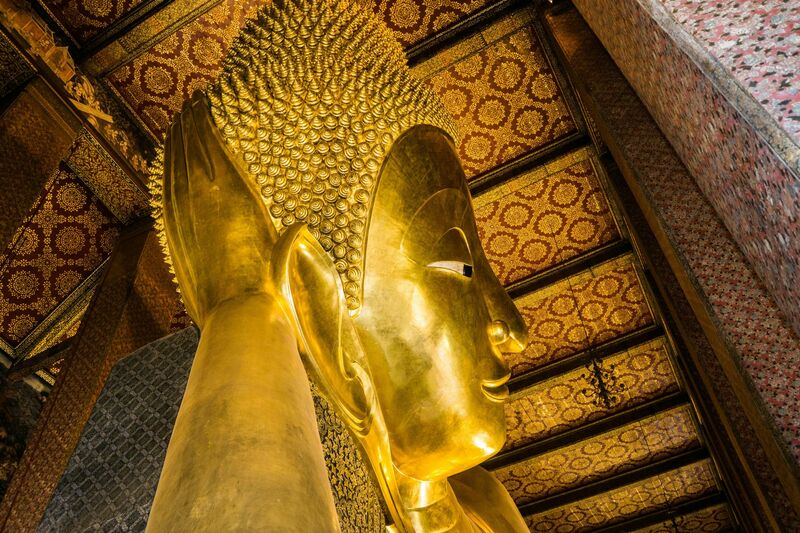 The Grand Palace is home of the “Temple of the Emerald Buddha” and Wat Pho houses a giant golden Buddha. A massive golden Buddha at Wat Pho. 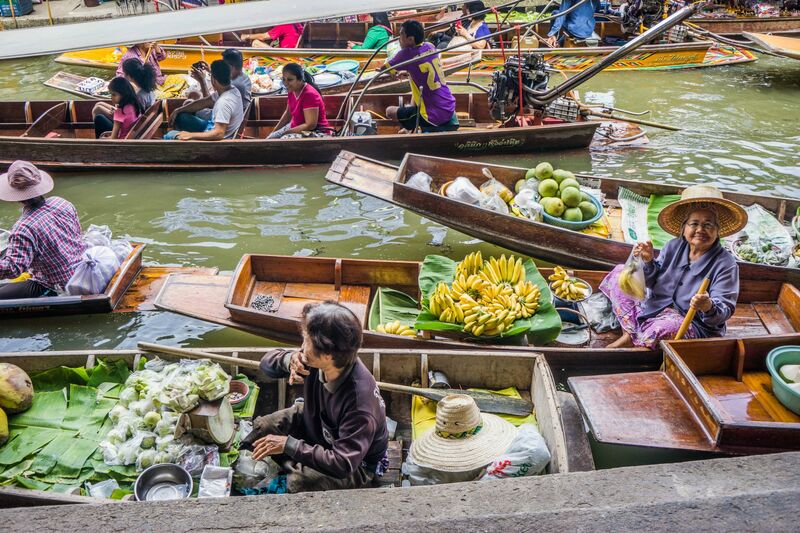 Venturing out of the city for a day we decided to visit one of the floating markets outside of Bangkok. After an hour car ride and 15 minutes on the back of a long-tail boat (long wooden boat with a car engine attached to the back) we arrived at Damnoen Saduak Floating Market. Vendors and shops line the sides of the river and you sit on a paddleboat as the guide navigates you to any (and all) shops you can handle. Happy vendors at Damnoen Saduak Floating Market. After our day trip to the floating market we decided to catch a movie (Finding Dory!) at a local mall/cinema. Movie theaters are spectacles in Bangkok. Paragon Cinemas (the theater located inside of the large and luxurious Paragon Mall) was massive and had a wide variety of modern films, including IMAX / 3D. Our last night in Bangkok we caught some free live jazz down the road at the Mandarin Oriental Hotel’s Bamboo Bar. Josh was excited to hear some covers of his favorite jazz artists including Chet Baker and Stan Getz. Chiang Mai was a brief stop for us, however we wanted to get a feel for another area in Thailand before our departure. Our plan was to rent motorbikes and head along the Samoeng Loop, roughly a 120 km loop through the northern mountains of Thailand that starts and ends in Chiang Mai. Well, Mother Nature had different plans for us and we got rained out of our lofty plans. A common backpacker town, Chiang Mai has a city center that boasts a night bazaar (market) for both shopping and eating. We did enjoy our time in Chiang Mai and although did not do the Samoeng Loop (due to inclimate weather/rain), we did partake in a Thai cooking class, got to see some really neat waterfalls, and enjoyed the night markets (including Josh’s favorite new dessert – mango with sweet sticky rice). 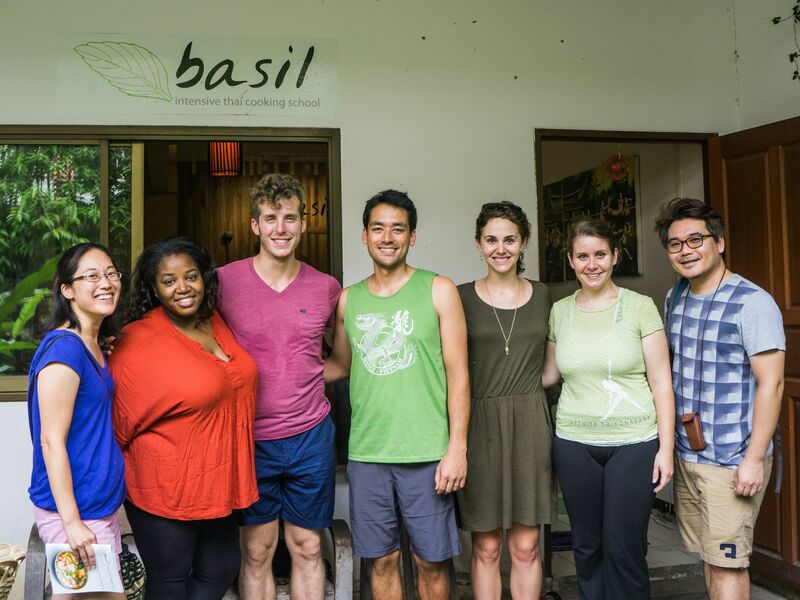 An "All-American" cooking class at Thai Basil. We met some of the nicest people in Siem Reap! The Cambodian people were very friendly and we enjoyed our brief stay in Cambodia. Our stay at the Méridien Angkor (through the use of Starwood reward points) was one of the most memorable we’ve had thanks to the friendly staff. 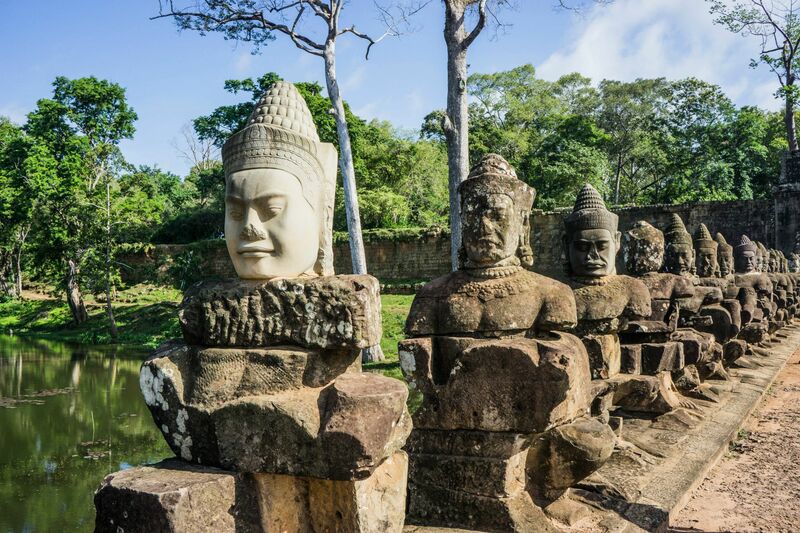 As we mentioned earlier in the article, Siem Reap is visited almost exclusively for its access to the Temples of Angkor which features the largest religious monument in the world - Angkor Wat. We had such a great time that we dedicated an entire blog post focused on our experience touring the Temples of Angkor. 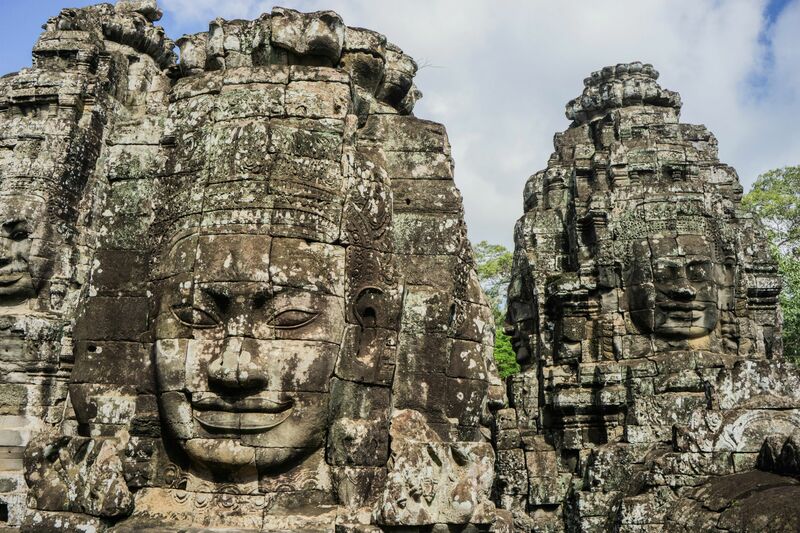 Bayon is just one of the many fascinating sites in the Temples of Angkor. Similar to Bangkok, KL is a mega city in Asia and it was fun to walk around the Petronas Towers or check out the many shopping malls (KL is consistently voted as one of the top ten cities in the world for shopping). Although we could not really afford to shop it was still fun to wander around their massive malls.